The WayMotorWorks custom 17% MINI Cooper Supercharger pulley for R53 MINI Cooper S increases the rotating speed of the supercharger by reducing the diameter of the pulley driving your supercharger. 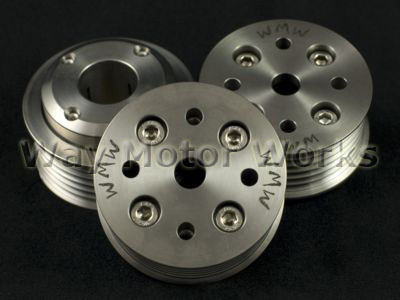 The WMW supercharger pulley is CNC machined from the highest quality stainless steel to exacting tolerances for perfect balance. The 17% size reduction supercharger pulley is widely accepted as a great balance between performance gains and engine longevity. For the R53 Mini Cooper S this is definitely the best HP for your buck modification! Way Motor Works installed a pulley on my 06 MINI Cooper S a few months ago and since then my driving experience has been enhanced tremendously. I already loved the agility of my MINI before the pulley was installed, but now it flies. I would strongly recommend this mod to R53 MINI Cooper S owners! Way installed my 17% pulley and the results have been great. I look forward to the next steps in peformance enhancment of my R53. Thanks Way! I've been running this pulley for months now. be sure to use the puller tool, it will make life easier. dont hesitate, get it! Jason @ WMW just installed the 17% pulley on my R53. At first I have to admit and I did not notice a difference. But once on the highway, it quickly jumped when i stepped on the accelerator! Well worth the installation and recommend it. Ad great service and crew. Thanks guys. I added this one to my GP because it is smaller than the JCW already on my car. I took it for a test drive after Waylen installed it and came back with a BIG smile. Enough said!